Hello, magician friends around the world...The new issue of TGM is ready! Welcome back to the pages of TGM - volume Four, issue Three. Read the contents of this 'labor of the love' below and you are sure to run for it. 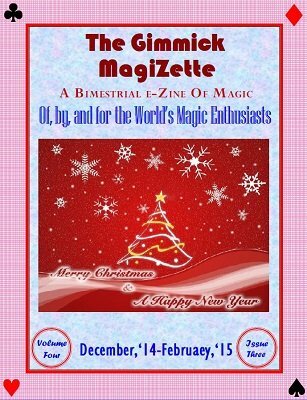 This issue is a staggering collection of articles, magic effects (I hate the word 'trick' - magicians do 'magic' whereas 'tricks' are done by the 'tricksters'), photo quiz, jokes, cartoons, news and views and more. Past Glory of India - Roy the Mystic recounted by Saileshwar Mukherjee. A Fire without Damage by P.K. Ilango is an exceptional close-up effect. ALL ALIKE by Aldo Colombini is a great card caper for close-up entertainers. New Deck Trick(s) by Guy M. Townsend is another interesting effect with Townsend Touch! THE TRIO - My 3 Paddle Tricks by Gora Datta - "gems" for the DIY enthusiasts. 21st Century Torn & Restored Card by Solyl Kundu - the title says the effect. Glimpse From Peek & Control by Fabian - This is exactly the same as expected from Aldo C.
Party Magician in action etc.